2019 is about to arrive and it will be the most important year for the entire cricketing fraternity as the ICC Cricket World Cup is set to take place. The teams have toiled for over an year to get their team combinations right and to get a settled squad before the World Cup and a lot of match practice. Teams like Afghanistan and West Indies had to fight for their place in the Qualifiers. In this segment, we shall take a look at where the top ODI teams stand with respect to their performances in 2018. Australia had a torrid time this year in both ODIs and Tests post the suspensions of Steve Smith and Warner. They played ODIs only against England and South Africa this year and both the teams outplayed them. 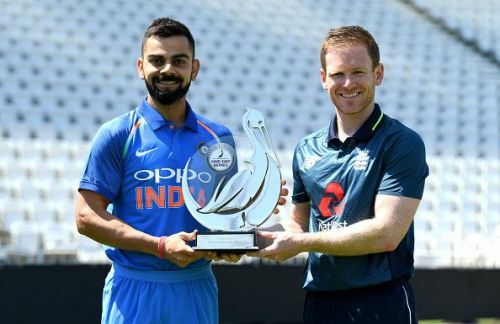 In 10 ODIs against England, Australia were able to win only 1 game while England won the rest clearly justifying their position on the top of the ICC Rankings. Against South Africa, the Aussies won 1 out of 3 ODIs. Smith and Warner are set to return before the World Cup. However, the team's position seems uncertain and we will have to see what happens against India. West Indies had a forgettable year this time despite qualifying for the World Cup. They could manage only 3 wins against the Top 10 teams in ODIs and 5 of their 8 wins this year came against below par teams like Papua New Guinea, Scotland and U.A.E in the World Cup Qualifiers and they were beaten twice by Afghanistan in the same tournament. They put up a fight against India winning and tying 1 game but they lost. They won just 2 out of 6 ODIs against Bangladesh. West Indies have found a couple of young stars but only time will tell if their squad has the strength to pose a real threat to other teams. Pakistan had a decent year in 2018 and dominated in T20Is and played well in Test matches. Their ODI results weren't that good as except for a clinical whitewash of below par Zimbabwe, there wasn't much to celebrate in the 50-over format for Pakistan. They lost 6 out of 8 ODIs to New Zealand. They lost 2 out of 2 to India and lost 1 to Bangladesh as well in the Asia Cup. They beat Afghanistan and Hong Kong in the Asia Cup and despite having a good squad, the results haven't come against the top sides and Pakistan need to figure out what the issue is before the World Cup.